Recently we wrote a comparison between the Leupold GX-1 and Leupold GX-3 to help shoppers choose between the two for the golf fanatics on their lists. Here we present the same comparison between the Leupold GX-2 and Leupold GX-4, which are nearly the same range finders as the GX-1 and GX-3, except that they are not tournament-legal. The GX-2 and GX-4 both provide slope-adjusted distance readings, and both have Leupold’s True Golf RangeTM (TGR) and Club SelectorTM features, which go beyond slope compensation. As with the GX-1/GX-3 comparison, we’re not going to recommend one range finder over the other. Both the Leupold GX-2 and GX-4 are worthy devices, and the differences between them are pretty much the same as the differences between the GX-1 and GX-3. Either would be a fine addition to any golfer’s arsenal. The choice between these two will come down to personal taste, and cost, as the GX-4 is more expensive than the GX-2. The Leupold GX-2 and GX-4 both sport a small form factor, and are operated with one hand. The differences in dimensions are just fractions of an inch, so there’s no reason for choosing one over the other solely based on size. The difference in maximum range between the GX-2 and GX-4 is negligible. The GX-2 has a maximum range of 750 yards, while the Leupold GX-4 comes in at 800. Unless you’re the Incredible Hulk and can actually drive a golf ball that far, the difference isn’t going to matter at all. Both range finders have 6x magnification, Fog Mode and Prism Lock, and they’re both weatherproof (but not waterproof) and take a CR-2 lithium battery. The GX-4 can be transformed from a slope-compensating range finder to one that returns line-of-sight distances only. This is accomplished by switching the yellow “smart key” faceplate with the chrome one. The idea was that the GX-4 could be used in tournaments with the slope, TGRTM and Club SelectorTM features turned off. Unfortunately, the USGA declared the Leupold GX-4 illegal for tournament play regardless of which faceplate is used. The Leupold GX-4 is internally constructed with solid aluminum, making it more rugged and weigh about an ounce more than the Leupold GX-2, which has a frame made entirely of plastic. Like the GX-1, the Leupold GX-2 displays distances and other information with a black LCD display. While this is fine when the background against which you’re aiming is light-colored, it can present a bit of a problem when your background is dark-colored trees. The black readout tends to blend into the background, making your distances hard to see. With the GX-4, Leupold has upgraded the display by using red OLED technology instead of the black LCD. Everything on the display stands out and is easy to read, regardless of how dark the background is behind your target. The Leupold GX-2 provides 7 different cross-hairs you can choose from to show in the display. Only 3 different aiming reticles are offered on the GX-4. This isn’t a big deal, but just another difference to mention. We like the stylish looks of the Leupold GX-4 over the GX-2, but of course that’s just a matter of opinion. And looks aren’t going to affect anyone’s game, one way or the other. 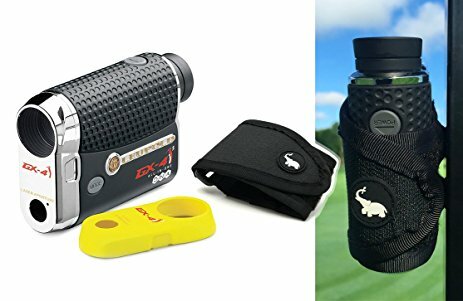 As one might expect, the GX-4, being a newer model that is an upgrade over the GX-2, is the more expensive range finder. Typically, the price difference runs around $100. With that additional cost, you’re paying for a more readable display and a more rugged device, due to the aluminum frame. Leupold GX-2 vs Leupold GX-4: Which Should You Buy? With the $100 or so price difference, the GX-2 won’t put as big a dent in your wallet as the GX-4. 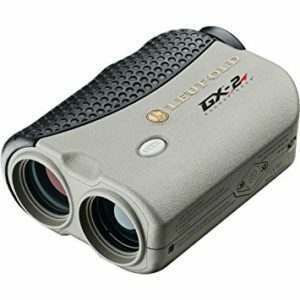 Despite the occasional readability issue with LCD display, it’s still an excellent range finder and will give you distances just as quickly and accurately as the GX-4. You won’t have any trouble reading the GX-4′s display, so if readability is a concern, you may want to go with the GX-4. You can also expect the GX-4 to be a hardier device than the GX-2, due to its aluminum frame. Range finders aren’t cheap, so for those prone to dropping or breaking things, it might be worthwhile to pay the extra cost upfront to avoid having to buy a replacement down the road. With the USGA ruling that the GX-4 is not legal for tournament use (period), the ability to switch the device back and forth between a “standard” range finder that only gives straight-line yardages and a slope-compensating device is just a novelty. Too bad. As you can see, the Leupold GX-2 and GX-4 are very nearly the same range finder. The construction and display are basically the only notable differences, and either will do a fine job of giving you accurate distances quickly and easily. When you’re here, you’re part of our club. And in our club you’ll find a wide variety of information aimed to help you improve your golf game. We also have tons of in-depth reviews of some of the most popular golf clubs, equipment, tech, and accessories to help you choose the right gear best suited for your own individual needs.